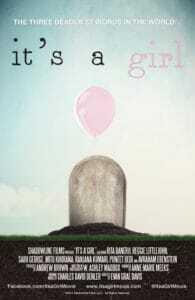 My first feature length documentary film, It’s a Girl, was released in September 2012 and is screening around the world. It’s a Girl has shown at over 700 screenings in over 20 countries around the world, including the British Parliament in London, the European Union in Brussels, at the UN Commission on the Status of Women, and recently on Capitol Hill in Washington DC. It’s a Girl has screened multiple times internationally as a part of International Women’s Day. It has been available on Netflix, Hulu, iTunes and many other digital distribution outlets. In the first few short months that It’s a Girl hit the world stage, nearly half a million people joined the cause, with close to 1 million actions taken, ranging from signing petitions to donating to our partners working to combat gendercide in India and China on the front lines. The film has raised significant exposure and support for the ongoing work of action partners like Women’s Rights Without Frontiers and Invisible Girl Project. It’s a Girl has been acclaimed worldwide in articles, reviews and on radio and TV, including The Independent, Emirates Women Magazine, The Current on CBC Canada, NPR, and The New Internationalist to name a few. It has been featured and recognized at leading Human Rights Film Festivals like Amnesty International’s Reel Awareness Film Festival and the “this human world” human rights film festival in Vienna. As a result of the film, I have been privileged to engage leaders and influencers on the issue of gendercide at two TEDx events. It has inspired people like Omékongo Dibinga – a rapper, trilingual poet, CNN contributor, motivational speaker, TV Talk Show Host and the Director of UPstander International who, inspired by the It’s a Girl trailer, decided to lend his voice to the cause by writing and recording a hip-hop song. Omékongo captured so well the inner conflict so many of us experience when learning about gendercide, that we decided to produce a music video of his song. We are so excited to be the first to share with you the It’s a Girl music video! People like Deesh Sekhon, a wife and mother from Abbotsford, BC who, after seeing the trailer, launched GirlKind Foundation, which is advocating and educating for change in cultural beliefs and taking a stand against Gendercide in India. Deesh and GirlKind Foundation have become champions for the cause, holding screenings of It’s a Girl throughout Canada. People like former UN diplomat Michael Platzer and his team, who, after seeing It’s a Girl, organized a one-day symposium at the UN in Vienna on fighting femicide (gendercide), where ambassadors, social scientists, NGO representatives, statisticians, lawyers and feminist activists had the opportunity to speak about gendercide, explain its meaning and causes, and present examples of best practice in fighting gendercide. The symposium culminated with the release of the Vienna Declaration on Femicide, a document urging UN member states, UN organizations and civil society to join forces and take responsibility to put an end to gendercide. The declaration was signed by the participants of the symposium as well as by Austria, Slovenia, the Philippines and Norway and it was presented at the UN Commission on the Status of Women.